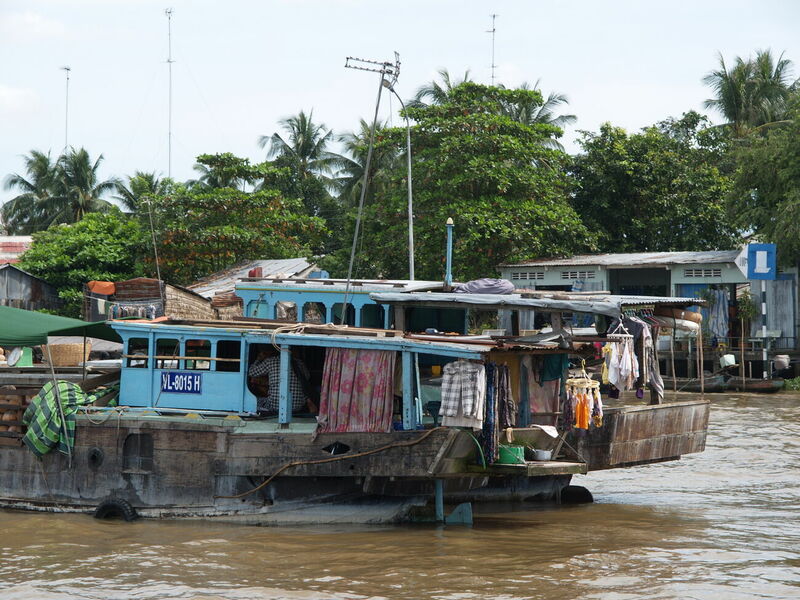 Richard had booked us onto a day tour of the Mekong Delta — we would go with the tour to Vinh Long but not return with them — which left from conveniently near the hotel. Our guide was Son, who had studied in the US in 1972 (and seemed to have had some problems before liberalisation in 1986). 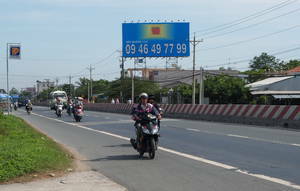 The bus followed National Highway 1 to Cai Be. Notable sights: fishponds in the median strip; a mix of old and new buildings, including some very narrow buildings by themselves in the fields, like isolated terraces; advertising everywhere, some of it quite "modern". At Cai Be we transferred onto a boat. 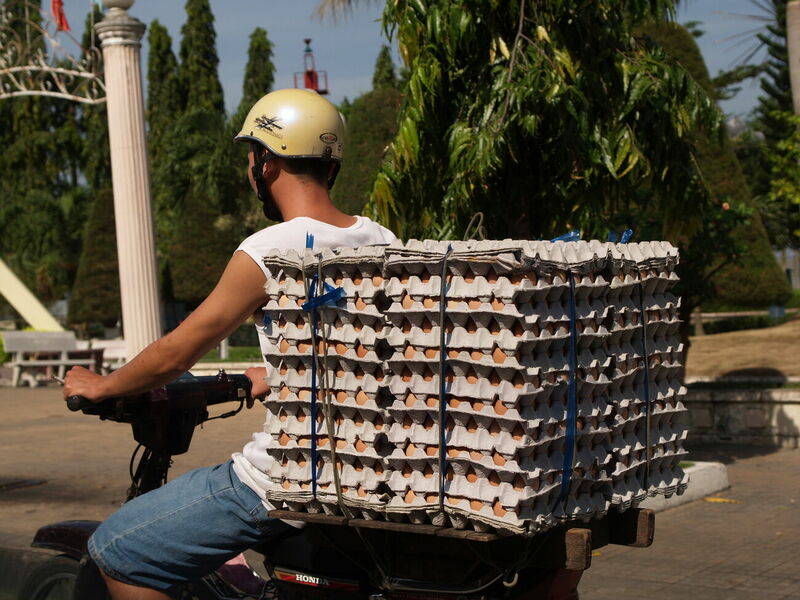 First stop was the floating market, which was not terribly exciting as the action happens in the morning. 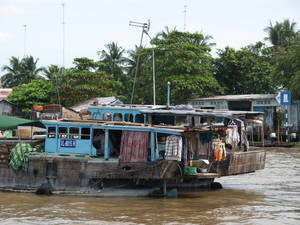 But this was our first look at the Mekong, and the ordinary life along the river was fascinating enough. Next we visited a sweet factory, where they processed coconuts, rice, etc. to make lollies — and were well set up to sell souvenirs to tourists. 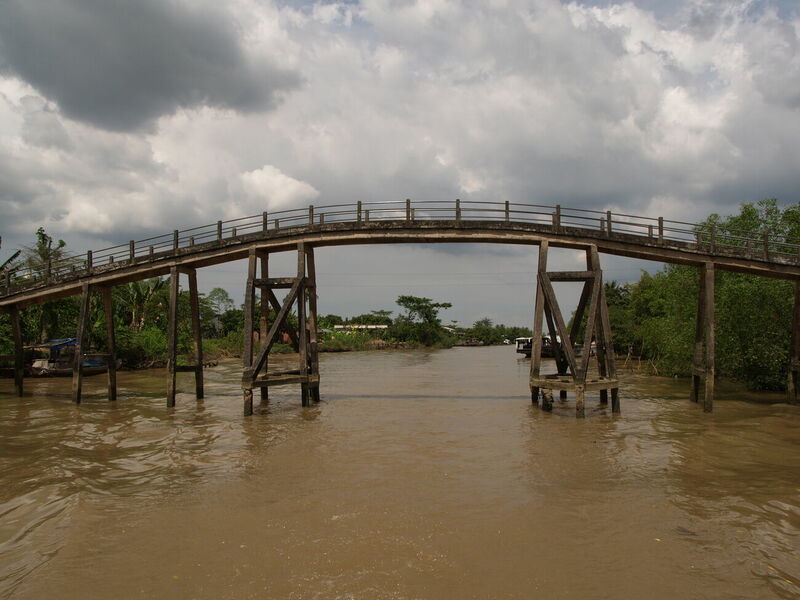 Crossing one of the main branches of the Mekong, the boat continued to a lunch stop, I think somewhere on An Binh island. 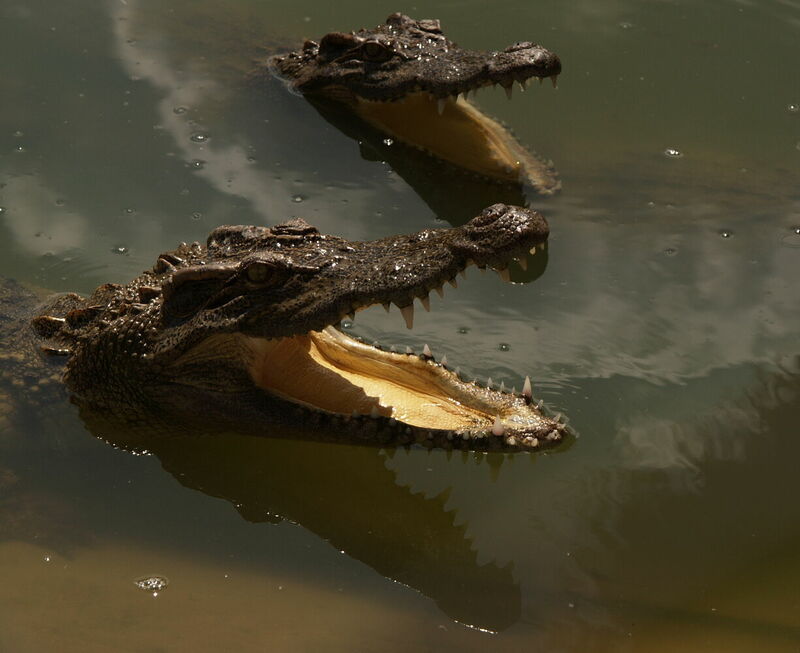 Here we had simple chicken and rice, looked at some caged crocodiles — river caiman, not big saltwater crocs — and listened to a brief traditional music performance, with singers backed by an electric mandolin and guitar. 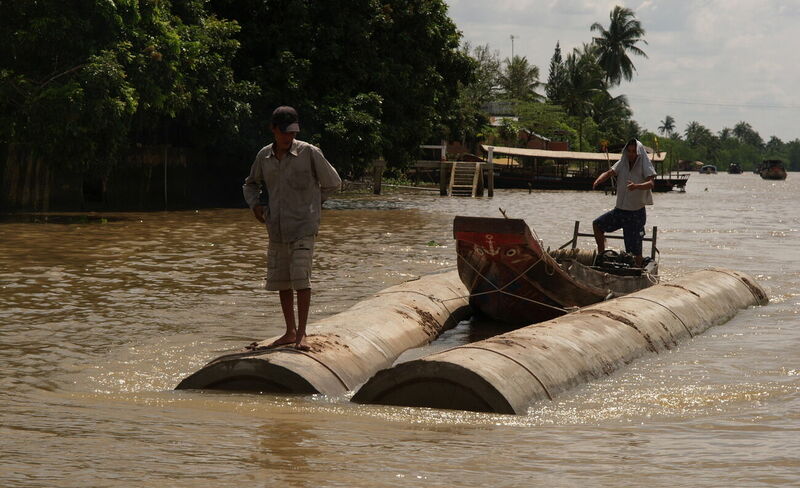 The boat then continued to Vinh Long, where we left the tour group. The Cuu Long hotel was full, so we sat in the foyer while I pulled out the netbook and looked in the guidebook for other accommodation. I then left Richard, not so mobile with his limp, and found us rooms ($15 each) in the Van Trim guesthouse, a little family-run place with five rooms. 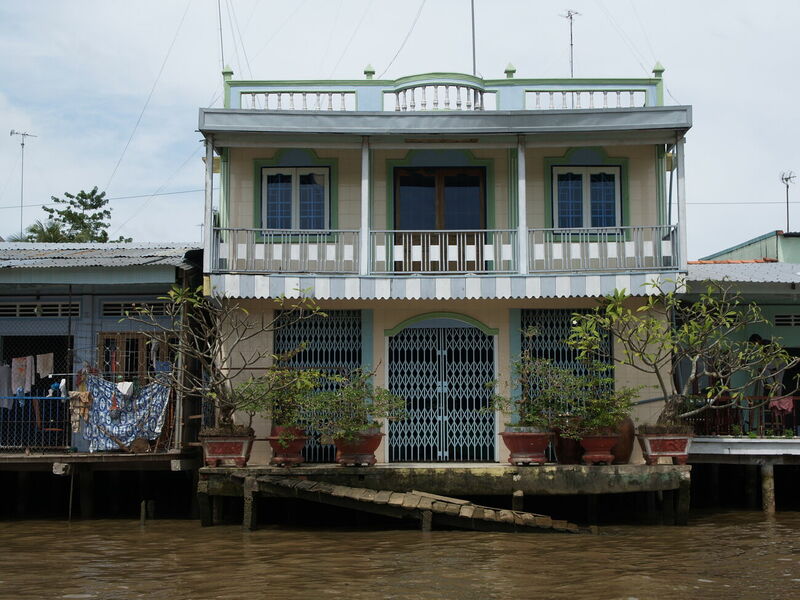 Richard's room was on the second floor, which with no lift was a bit of haul for him, but otherwise the place was perfect — just across the street from the riverfront, with a view across the Co Chien River (one of the Mekong branches). For a bonus, there was unsecured wireless from the hotel next door, so I sent off a few emails to let everyone know I was safe. 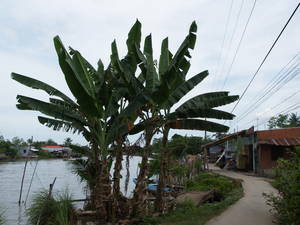 I went for a walk through the local market, which started just next to the guesthouse, and then joined Richard and sit on a bench by the river in the shade, with a lovely breeze blowing. 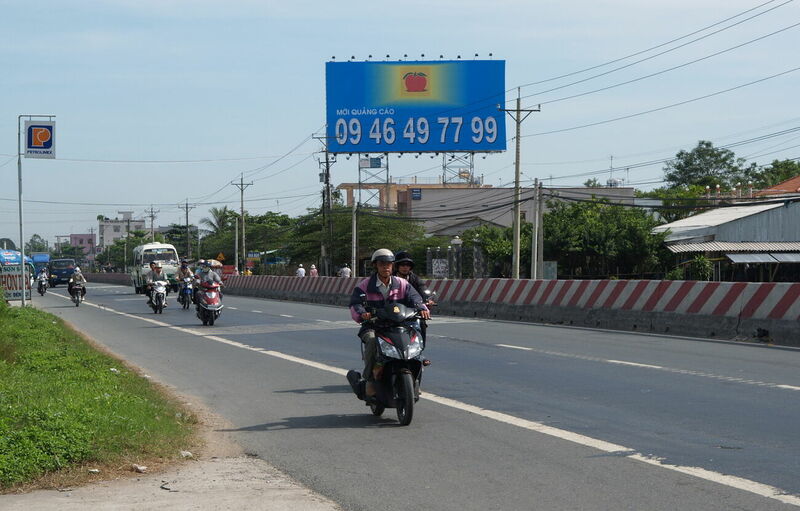 The daytime temperatures during the trip rarely dropped much below 28 to 30. But in the Delta we usually had some kind of breeze, and it didn't seem nearly as hot as Cambodia was later. We bought pork rolls from a street vendor and watched the world go by. 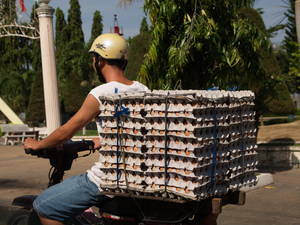 There were lots of scooters and motorcycles ("hondas"), but almost no cars. And people gave way, so the traffic was not at all scary. A flock of school girls came by in shining white, which it seemed impossible they could keep clean. 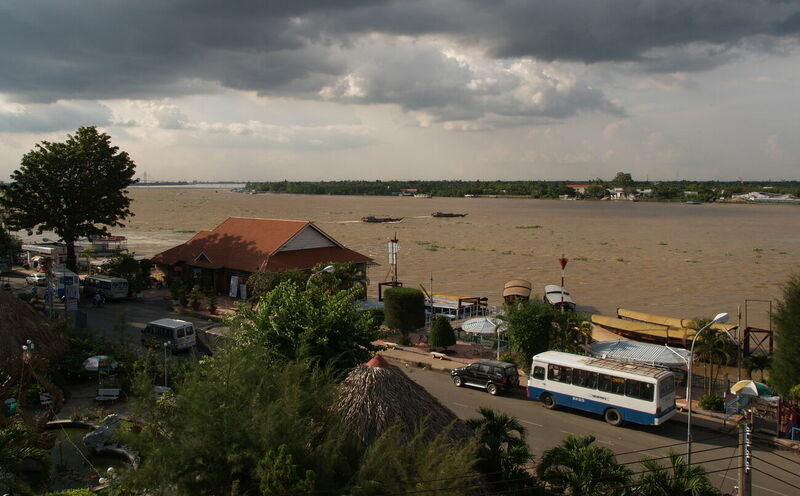 On the other side of us was the Mekong and the occasional boat. All of the boats, above a certain size, have brightly painted red and black eyes on the front, even when the rest of the boat was drably utilitarian. Our tour guide had explained that this was to let the fish know that the boat was "a brother". 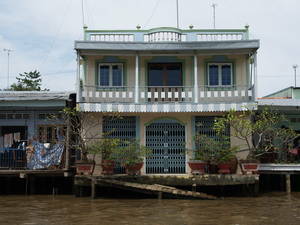 For dinner we went to a restaurant (Phuong Thuy) on the edge of the river. One large table of Malaysian (?) students were learning some Vietnamese (with instructions in English). We had "make your own" fried fish w/ rice paper rolls, which was excellent, a chicken dish which was good but not so exciting, and grilled frog, which I liked but Richard wasn't so keen on. We had coffee in the Hoa Nang Cafe, just across the road on the waterfront. I went to buy a bottle of water, but my first attempt was in a small supermarket where three women were working furiously with calculators and account books, while deliveries were made, and took no notice of me at all. Outside the tourist areas of Saigon, and a few places where tourists clustered — the tourist boat wharf here, the bus station in Chau Doc — we never really got pestered. It seems that tourists are common enough in the Delta not to be exciting, but not so common that the entire economy has shifted to catering for them. 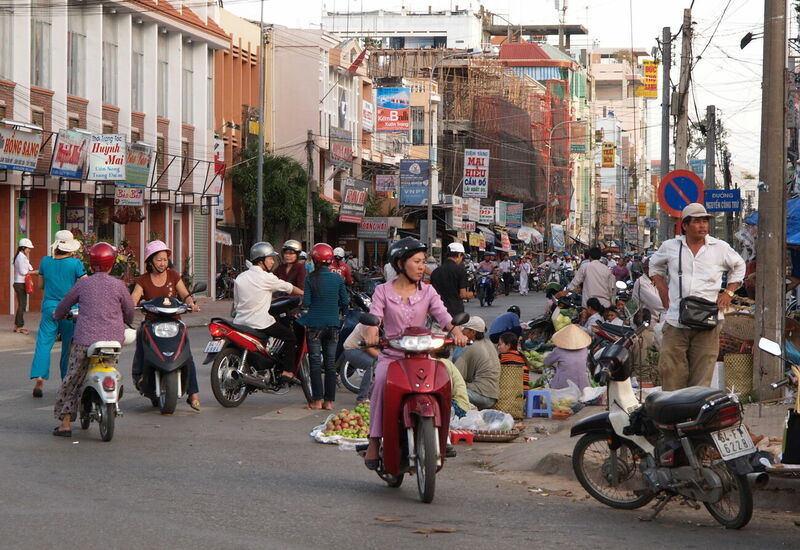 We had breakfast in the same place we'd had dinner — a nice noodle soup with prawn, chicken and vegies (20,000 dong). 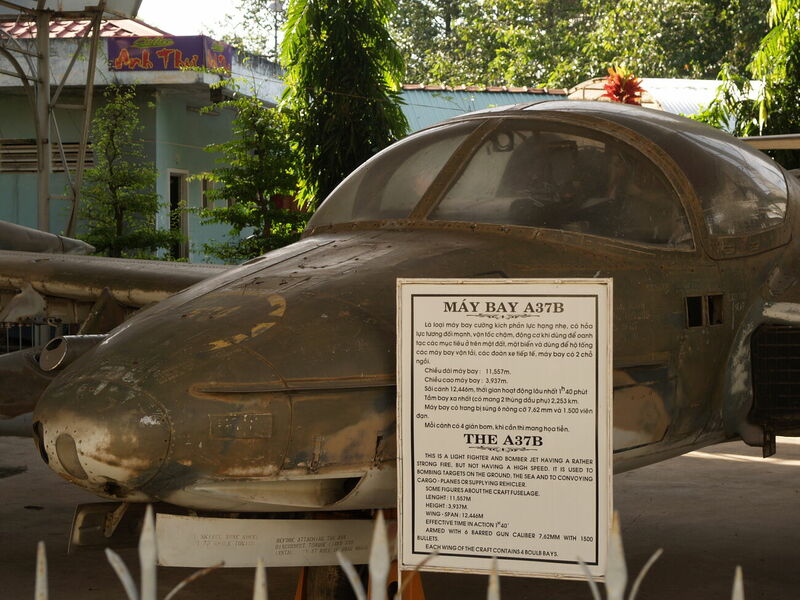 Very close by, but stumbled on by us only by accident, is the little open-air "Vinh Long Museum" which has aircraft, tanks, etc. 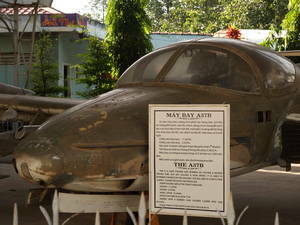 from the Second Indochina War (which is known in some places as "the Vietnam War", but here as "the American War"). The Lonely Planet guidebook doesn't mention the museum at all (and I had to update the Wikipedia article on the A37 Dragonfly, which didn't include the A37B here in its "on display" list). 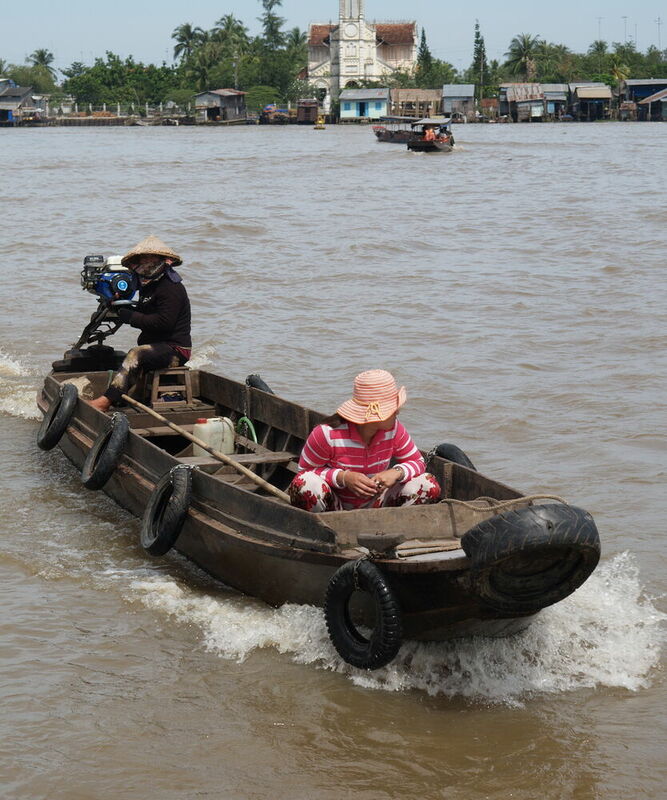 As attractions in Vinh Long, the guidebook mentions the Van Thanh Mieu Temple, 3km inland along the canal, which we didn't see, and the Mekong islands, which we'd got a brief look at on the boat from Cai Be. 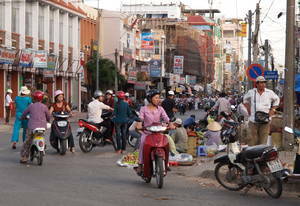 After watching a funeral procession go buy, we waited in the travel agent for our taxi. 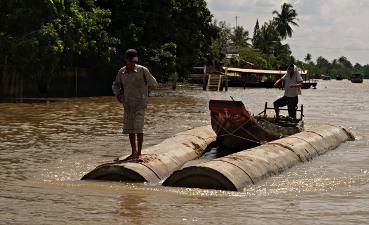 When this arrived it took us west to a place where we could pick up the bus from Ho Chi Minh City to Chau Doc.